Rare gold coins deserve a special treatment and protection but what if your coin is not of an average shape or size? What if your gold coins are of unusual dimensions and will not fit in standard plastic coin holders or cardboard coin holders? Creators of Air Tite coin holders came up with a brilliant idea to manufacture holders that can accommodate virtually any precious metal coins of all shapes and sizes. Airtite coin holders have literally an endless list of items they can hold, including historical medallions, casino chips, commemorative and rare coins of odd shapes from all over the world and any historical period. 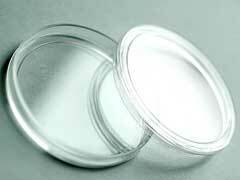 Air Tite coin holders present a 2-piece clear plastic compartment that snaps together to provide your coins with ultimate protection and safety. Custom fitting is achieved by additional foam rings that are made of 100% inert materials that will not interact with your coins resulting in air contamination, tarnishing and coin damage. Both the cases and the foam rings will not get yellow or get cloudy over time like many plastic gold coin holders that become easily scratched and may change colors. Most Air Tite coin holders are available in the following models A (10-19mm), T (20-25mm), H (26-32mm), I (33-42mm), X (39-44mm), and Y (47-50.8mm) and allow coins collectors, investors, dealers, museum and government agencies to preserve their rare historical or bullion coins in ultimate condition. In addition, manufacturers of Air Tite coin holders also have several available sizes to hold your silver of gold bullion bars. To enhance your coins presentation, consider purchasing coin chests or wall display frames to show off your incredible collection. Bottom line, no matter whether you are looking for a Gold Eagle coin holder or odd shaped Chinese rare coins , Air Tite coin holders are a great way to protect your coins and other memorabilia by custom fitting your precious collector possessions.